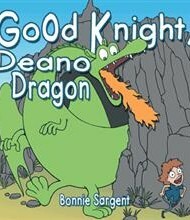 From its format to its plot, Bonnie Sargent’s Good Knight, Deano Dragon defies expectations. First, the 8.5-by-8.5-inch format suggests a picture book; instead, this children’s dragon-hunting adventure includes just five illustrations. Then, much of the action, including an amazing feat that saves a kingdom, centers on protagonist Tristan’s flatulence, rarely standard fare for a young audience. At the outset, Tristan decides to risk his life attempting to slay a dragon that, coupled with a drought, has taken all the kingdom’s food except beans. That diet gives Tristan so much gas and diarrhea that he is bullied over his “foul smell” and mockingly dubbed “Sir Farty Fatty.” En route to the dragon’s lair, he is “bent over” with pains and hurries more than once to “yank down his pants and empty his bowels.” The author notes that a “steaming pile” results and describes Tristan cleaning himself with grass. Further surprises occur when the dragon befriends Tristan instead of breathing flames on him and agrees to return some food to the kingdom. Sargent’s description of Tristan’s triumphant return – on the back of the flying dragon – is the book’s high point. Unfortunately, Sargent doesn’t stop there. To bring rain to the drought-stricken area, Tristan eats beans to expel gas, which the dragon ignites to form thunderclouds. While there is a place for bathroom humor in children’s literature, Sargent relies too much on flatulence and defecation, which, in places, is too graphic for good taste. Other problems include copyediting errors, such as suddenly changing the name of the newly knighted “Sir Deano Mighty Dragon, Rain Maker” to “Sir Dudley Magnificent Dragon, Rain Maker” in the epilogue. And, while it’s laudable to credit “Certain stock imagery © Thinkstock” in the book’s front matter, it becomes unclear what work is illustrator Kathy Kerber’s and what is not. While the latter issues are relatively minor and could be fixed, the crude plot of this book cannot be recommended for young readers.